A New History of Modern Latin America provides an engaging and readable narrative history of the nations of Latin America from the Wars of Independence in the nineteenth century to the democratic turn in the twenty-first. 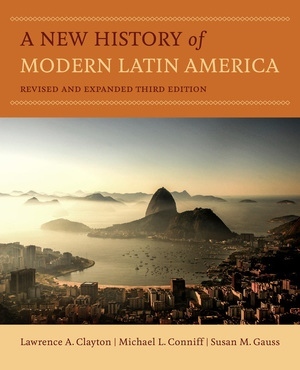 This new edition of a well-known text has been revised and updated to include the most recent interpretations of major themes in the economic, social, and cultural history of the region to show the unity of the Latin America experience while exploring the diversity of the region’s geography, peoples, and cultures. It also presents substantial new material on women, gender, and race in the region. Each chapter begins with primary documents, offering glimpses into moments in history and setting the scene for the chapter, and concludes with timelines and key words to reinforce content. Discussion questions are included to help students with research assignments and papers. Both professors and students will find its narrative, chronological approach a useful guide to the history of this important area of the world. Lawrence Clayton is Professor Emeritus of History at the University of Alabama. He is the author of Bartolomé de las Casas and the Conquest of the Americas and Peru and the United States: The Condor and the Eagle, among other titles. Michael L. Conniff is Professor Emeritus of History at San José State University, where he directed the Global Studies Initiative. His books include Africans in the Americas, Panama and the United States, and Populism in Latin America, among others. Susan Gauss is Associate Professor of Latin American and Iberian Studies at the University of Massachusetts, Boston. She is the author of Made in Mexico: Regions, Nation, and the State in the Rise of Mexican Industrialism, 1920s–1940s.